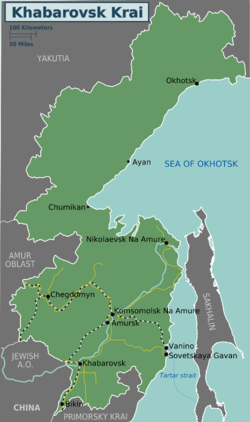 Khabarovsk Krai (Russian: Хаба́ровский край, khuh-BAH-ruhf-skee krigh) is a region in the Russian Far East, which borders Amur Oblast to the west, Magadan Oblast to the north, Sakhalin Oblast across the Nevelsky Straits to the east, Primorsky Krai to the southeast, and Birobidzhan and China to the south. Vladimirovka, located miles and miles away from Komsomolsk, a native village of Negidals. Khabarovsk Krai occupies a long swathe of Russia's Pacific coastline, a full 2000 kilometers of it, going as far south as Sakhalin and north to Magadan Oblast. At nearly 800.000 km², it's Russias forth largest province. In the north, taiga and tundra prevail, deciduous forests in the south, and swampy forests in the central areas around Nikolaevsk-on-Amur, as a testament to it's size there are more than 50 thousand lakes to fish in, more rivers and streams than you would care to count, and several mountain ranges intersect the region, including the northern reaches of the Sikhote-Alin mountains shared with Primorsky krai. The highest point is Mount Bery, towering nearly in fact, three quarters of the area is occupied by mountains and plateaus. The diversity of purely North animals like brown bear and sheer South representatives like Eastern softshell spiny turtle (Trionix) is backed by the legend that God would mix the rest of seeds and animals when somebody told him about missing spot on Earth. One can encounter pine-tree and wild Far-Eastern grape which came definately from the South. Its blue round berries with sour taste are cultivated in gardens to produce home wine. Like Trionix many species are listed in the Red Book. Aboriginal culture within small enclaves across the krai are Nanai, Ulchi, Manchur, Orochi, Udege, Negidal, Nivkhi, Evenki and varies in each settlement. The last Chinese Emperor Pu Yi lived in Khabarovsk from 1945 to 1950. According to most everyone but the North Koreans themselves, who of course claim he was born on the holy Baekdu Mountain, North Korea's "Benevolent" dictator, Kim Jong-il was actually born in the North Korean logging camp "Vyatskoye" (Вя́тское), north-east of Khabarovsk. A couple these camps actually still exist, but are strictly off limits to foreigners. Khabarovsk is a major transportation hub for the entire Russian Far East and will likely be any visitor's first stop by either the Trans-Siberian Railway or via Khabarovsk's international airport. From China there are two entrance routes: one begins on the border with the Heihe-Blagoveshchensk crossing point, the other from Fuyuan town on Amur river. Another possible way is one from Sakhalin, where international ferry operates between Russian Korsakov and Japan's Wakkanai. A one-night bus trip along the federal highway Vladivostok-Khabarovsk is an option for a traveller, if the train carriage by some odd reason is not preferable. Vast, rugged and sparsely populated the krai is not big on roads. Too cold for regular ferry service, since much of the region goes into a deep freeze during the harsh winters, add the presence of Russia's most important aircraft plant to the mix, and you are pretty much left with Soviet era Yakovlevs, Antonovs and helicopters to get you around, making exploration an expensive and fairly unnerving proposition. On the upside this also means you'll have some of the planet's most spectacular nature all by yourself if you take on the effort. Khabarovsk Airlines (Хабаровские авиалинии), ☎ +7 (42135) 2-01-10. (NO) Is a public regional airline based in Nikolaevsk-on-Amur with cargo and passenger flights to Okhotsk, Chumikan and Khabarovsk, and serveral other small villages with An-2 & 24 aswell as YAK-40 aircraft. The local government have plans on merging these two regional airlines, but so far no concrete plans has surfaced. Fishing and hunting in the wild are the major attractions for local villagers, town and city dwellers as well as trekking routes to taiga plains and mountains untouched by humans are favourite activities for all sorts of tourists. Khabarovsk and Komsomolsk mountain bike clubs are all at it. Taiga forest roads are always abuzz with mosquitos in summer and the best seasons for visiting are May and September when the air is not so stifling and the sun is just warm. Winter attracts regional skiers and snowboarders to the ski bases "Holdomi" and "Amut Snow Lake" near Komsomolsk and "Spartak" slopes near Khabarovsk. Local food follows traditional Russian cuisine featured with salted bracken, mushrooms, Korean and Chinese and even European dishes served in theme restaurants of two big cities. Don't forget to taste pancakes with a spoonful of linden, wildflower, buckweat honey or a season caviar stuffing. The regions major distillery is appropriately called Khabarovsky Distillery (Ликероводочный завод Хабаровский, ), besides the ritual vodka - a full 16 different brands of it - they also make sweet liqueurs, bitters and cognac, check their website with neat pictures of the bottles to spot them in the shops. If you haven't yet acquired a taste for vodka, the local (but Heineken owned) Amur-Pivo (Амур-пиво) is not bad. The (Carlsberg owned) competitor Baltika's main local brand is the ДВ (DV) beer, which is also brewed in Khabarovsk. Snakes, bears are rare attackers in the wild, lest provoked. More dangerous are infectious ticks which are active most of all in spring. Use spray against ticks. Khabarovsk is the hub for regional air travel with important flights to Russian destinations Anadyr, Irkutsk, Krasnoyarsk, Magadan, Moscow, Petropavlovsk-Kamchatsky, Yakutsk, and Yuzhno-Sakhalinsk, as well as international flights to Niigata, Japan and to Seoul, Korea. There are no direct flights to/from the US. The next major stops to the east on the Trans-Siberian Railway are Ussuriysk and Vladivostok; to the west, Birobidzhan. There is a regular ferry from Vanino (the terminus of the Baikal-Amur Mainline) to Kholmsk, Sakhalin. This page was last edited on 10 March 2016, at 13:57.